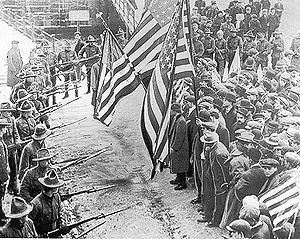 Labour union demonstrators of the Industrial Workers of the World held back by soldiers, during the 1912 Lawrence textile strike in Lawrence, Massachusetts. A trades union (U.S: trade union) is an organisation or group of workers who join together to negotiate pay, hours, benefits, and working conditions. Union members and supporters of unions claim that they are necessary because the people that run companies want to pay as little as possible. In the United States, they are often called labor unions. The term as used in Britain is trades union (plural: trades unions) because they were a joining of men working in different trades. For example: on the engine of a steam locomotive were two men: a driver and a stoker shovelling the coal into the oven. The driver was a skilled man, and paid much more than the stoker. They were two different trades. When they joined into the Associated Society of Locomotive Engineers and Firemen (ASLEF), their negotiations with management was done together. A quite different union, the National Union of Railwaymen (NUR) looked after other employees of the railway compaies. That was a whole collection of different trades. 3.1.7 Why was the GNCTU Formed? Collective bargaining: The leaders of a union work with management (the people who run the business) in order to get a contract that gives workers what they want. This is because union leaders can threaten to strike. Benefits: Early unions would give their members unemployment pay in case they were hurt on the job, unfairly fired, or sick. This is usually done by the government today. Unions may also give their members a lawyer to represent them if they are ever sued in court or charged with a crime. Politics: Unions often work to get laws passed which help their cause. Some raise money for politicians who are friendly to unions. They also lobby for laws which help out unions. Some political parties are very close to unions, like the Labour Party in the United Kingdom. Article 8 of the International Covenant on Economic, Social and Cultural Rights ensure the right to form and join trade union and use strikes. If collective bargaining does not work, unions often use strikes to get their demands. However, the threat of a strike is usually enough: over 98% of union contracts are renewed without a strike. Trades unions are the descendants of the trade guilds of mediaeval times. These guilds were made up of independent skilled workers (or artisans) who had been apprenticed and qualified by a guild. A trades union is a collection of people from different trades who want to keep and improve their jobs and their working and living conditions. Member of a trades union will usually working in the same industry. Trade unionism eventually became accepted as a fact of life by British governments and employers – but with much struggle. The acceptance of trades unions was no coincidence; it took place when British industry was at its most confident, steady economic growth had dampened revolutionary enthusiasm. At the same time providing the means whereby employers could buy off discontent with higher wages and improved conditions of work. This did not mean that unions were will liked by the Establishment. In fact, trades unions had to take care to create a good image in mid-Victorian terms in order to win tolerance and acceptance. However, in the early part of the nineteenth century the future of Trade Unionism was not certain. Trades unions developed slowly in Britain but they can be traced right back to the Middle Ages. In medieval towns and villages, trade guilds started to develop. With both the master and the employees assigned to the guild of their particular craft. In 1563 The Statute of Artificers was passed by Elizabeth 1’s government. The Statute had some negative effects such as not allowing apprentices to look for work outside of their parish but it had positive effects as well such as requiring justices of the peace to maintain living standards and to monitor apprentices in their district. This meant that craftsmen received some protection from the state. By the 19th century attitudes had changed. People now hated government interference in their businesses. As the population increased so did the size of businesses and it was no longer possible for employers to have a personal relationship with each employee. Due to this in 1813 the Statute was repealed. Now workers began to form trade clubs and associations to protect industrial and personal interests. Apprenticeship regulations – new entrants to the trade were strictly limited. Collective bargaining with employees to fix wage levels. Craft societies had only a few members and were restricted to a certain trade in a certain town. Members were usually literate and rationalist. The actual society was usually based on a public house, with meetings etc. convened there. These were different from trades unions but had some functions in common. Friendly societies were “self help” organisations. In exchange for a subscription fee, they would provide financial support to workers in the event of, for example, death or illness. They were usually locally based; Tyneside in the 1820s had 165 societies with a total of 10,000 members. Gradually the societies or groups of workers were formed into larger bodies called “combinations”. Instead of just paying out benefits, they became more militant and begun to lobby for better conditions and better pay etc. Workers were also able to petition parliament when they had a particular grievance over working conditions or wages for instance. Over the 18th century, these trade clubs became more aggressive and powerful. Small groups joined together into “combinations” and campaigned to improve working conditions and demanded higher wages. Some combinations organised local strikes. The government realised that something had to be done about combinations. The Aristocracy were worried about the number and power of combinations. The French Revolution only scared them more. As a result of the above mentioned situation, the Combination Acts of 1799 and 1800 were introduced. The acts forbade Labour Unions from combining to campaign for better working conditions and for an increase in wages. If workers broke this new law they could be sent to prison for up to 3 months. This act was strictly enforced. The combination acts had little success, trades union simply carried on in secret. E.P. Thomson claimed that the number of trade unions had even increased. Some unions called themselves “friendly societies” and thus continued to work. In 1823 a London tailor called Francis Place led the movement for repeal. With the support of MP Joseph Hume the government was convinced to set up a parliamentary committee to look into the issue of repeal. The government no longer feared revolution, combinations and peaceful bargaining now seemed acceptable. The committee recommended the repeal of the Combination Acts and parliament acted accordingly. The combination acts were repealed in 1824. Trades unions were now legal. Strikes quickly occurred across the country. The government then decided to bring in the Amending Combination Act in 1825 which allowed the existence of trades union but refused them the right to stage protests. 1. Preventative legislation (laws etc.) most notably the Combination Acts 1799–1800 2. The prevalence of the domestic system of working. 3. an identity of interest between employer and the domestic employee (domestic employees only had contact with their employer and not with their fellow employees – employers adopted a “paternalistic” approach to their workers) 4. Factory works was undeveloped in the early 19th century. As soon as factories had taken off the ‘working classes emerged. The traditional bond of trust between employer and employees were later eroded and working people began to club together. 5. Government fears. The government believed that all working people could club together and react en masse to social change scared the government. The ruling classes associated ‘combinations’ with revolution. The many Combination acts of 1700–1800 aimed to prevent trade unions from being formed. In the 1820s the idea of creating a national union was spreading. A cotton spinner from Manchester named John Doherty summoned a conference on the Isle of Man in 1829 to discuss the idea of a national trade union. He then formed the Grand General Union of Operative Spinners of Great Britain and Ireland. The following July he formed National Association for the Protection of Labour which was to be made of most trades. In 1831 the association had disintegrated; mainly due to poor communication links which made it impossible to organise events. In February 1834, the Grand National Consolidated Trade Union was formed, largely as a result of Robert Owen. Owen dreamed of a socialist society, he hoped that a national union would help this happen. Robert Owen was an important figure in the formation of the GNCTU. Owen and Doherty were associates and the GNCTU was based on Doherty’s Grand General Union. The union was heavily influenced by Owenite socialism. To protect workers from any erosion of wages and/or conditions. It is disputed whether of not his union succeeded. It lasted just six months (February to August 1834). Owen claimed that there was around half a million members, but other estimates put the figure at around 16,000 members. The union failed for a number of reasons. Owen did not really understand or empathise the suffering of the workers, who had genuine and immense concerns. The general body or workers favoured militant action but Owen preferred a steady, more legalistic approach. The size of the GNTCU also made any strikes difficult to organise. A further problem was the fact that many employers forbade their employees from joining the GNTCU, and refused to let them work if they had not signed a document which renounced the organisation. In February 1834 six workers for Tolpuddle in Dorset formed a union. 13 shillings was what the average family need to survive but the men were being paid just 9 shillings. Led by George Loveless the farm labourers fought for increased wages. James Frampton, the landowner, was determined to stop industrial action; he reported the group to the Home Secretary Lord Melbourne. The men were arrested, tried and sentenced to seven years transportation. The judge said that he made he did this to make an example of them for the sake of the stability of the nation. The men became known as the Tolpuddle Martyrs, and the judge's wishes were carried out. Support for the GNCTU fell dramatically and by August 1834 it had collapsed. The orthodox view is that trade unionism virtually stopped for the next 15 years after the collapse of the GNCTU, with many workers becoming involved in the alternative reforms adopted by Chartism. However, in the skilled trades unions were flourishing, with trade unions having an estimated 100,000 memberships in the early 1840s. Unions have been criticized for increasing the cost of workers. Because of this, it is said that fewer people will be hired. A union might also protect workers an employer feels are not productive enough. For example, many unions protect workers who have worked for a job for a long time from being punished or fired, even if new workers are faster. Some unions are also tied to organized crime, political corruption, or even tied to the employers of the workers they represent. ↑ Greenhouse, Steven (2002-12-12). "The Transit Showdown: Assessment". New York Times. ISSN 0362-4331. Retrieved 2008-06-19. This page was last changed on 13 December 2018, at 04:41.